In retrospect, I’d say we were adventurous. At the time, I may have been inclined to use the word delirious instead. Certainly groggy at best. Mainly it was because we had to be at the farmer’s market early. Earlier than usual in any event. And coffee had only been consumed in moderation. Maybe less than moderation. Clearly less than was necessary to attain reasonable social behavior. But we had no choice – Mother’s Day was upon us (well planned again! ), and a soccer game was starting soon. So we were at the market already at 8. AM. On Saturday. With way too little coffee. So we focused on what we needed for Mother’s day first – mainly strawberries. And flowers, of course. Which are also available at the farmer’s market. Bold colors, very bright – nothing subtle. Apparently subtle is dead. Even mothers now demand a smack of color right between the eyes. Dainty, delicate, or anything that would require any contemplation is dead. Just obscenely wild color, mainly red. 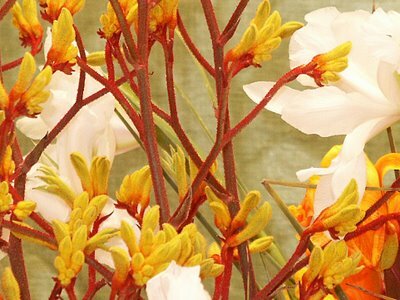 We got something called kangaroo paws. With some complementary colors to round it out. It was the most interesting thing there. Not the best seller by a long shot. But after that was done, we focused on the herbs. 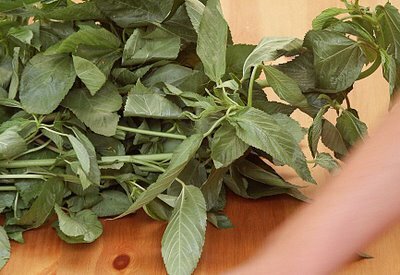 For the Weekend Herb Blogging at Kalyn's Kitchen. In a sort of daze, we just bobbled along with the crowd. Jostled here and there. Shooting by some stands, eddying around at other stands, trapped by little whirlpools of market shoppers. Ending at an Asian stand. Crowded with people. Frantically grabbing bunches of greens. Some sort of greens I could naturally not identify. Before I knew what I was doing, I grabbed some too. Just like that. And the pile was gone. Holding the green leafy prize in my hand, I tried to ask what this stuff could possibly be. But the seller could only tell me the name in an Asian language. I don’t even know which one, Korean, or Thai, or something else, who knows. So we stood there, still a bit in a stupor. When one of the fellow shoppers, an Asian lady, who had happened to hear my question, said she also did not know the name, but knew how to cook it. Chopped, even blended, cooked up with some broth, and served with chicken. Like a soup? I stammered. No, no, no! Just a bit of broth. And finely chopped. Even pureed. It gets thick, she replied. More like a sauce? I offered. This seemed to suit her better. And without any more concrete advice, she smiled and walked away. Hmmm. People obviously eat it. These people sell it. Must be edible somehow. So we bought it. As usual, it cost $1 for a bunch. The man who took our money seemed a bit more knowledgeable, and he indicated this thing was Okra Leaves. Okra, like the stuff you put into gumbo. Only the leaves, not the pod. Well, that was a new one. I was ready to give it a try. 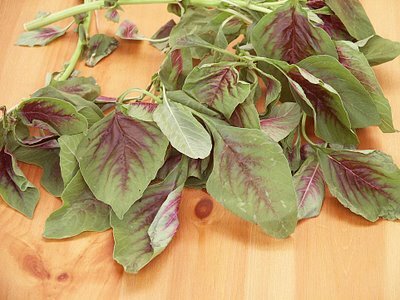 Before we finished, we found one more thing – red spinach – that also looked interesting. A dull green leaf with a brilliant red splash on it and a red stem. I swear – they should just lock me up till my third cup of coffee. 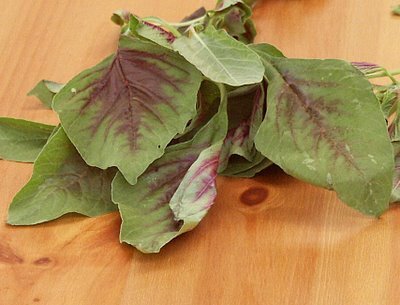 The Asian lady selling the red spinach told me about 10 times what it was called. I just could not capture the information in my brain. I got the spinach part, but not the red part. Until someone waiting behind us said something like “She said red – red! – like the color! – Christ!”. I paid my $1 and made a quick exit. Maybe it was her heavy foreign accent, but I blamed it primarily on the caffeine depravation. The red spinach I’m going to lightly sauté with garlic and olive oil. Maybe some Pecorino-Romano on top. I was told it is a little rougher than ‘regular’ spinach, so better sautéed or in soup. As I understand it, the interesting thing here is the red ‘juice’ from the stems that colors everything a bright pink. So TeenGirl is excited about that. The Okra Leaves are a bit more challenging. 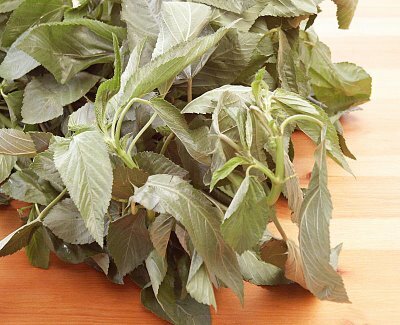 There is very little on Okra Leaves, in English, on the internet. With a lot of effort, it seems there is some info in, naturally, Asian languages. Which I can’t read or share here. It is also popular in Africa, popping up in some recipes from Sierra Leone. But there is nothing to find concerning the particular qualities of Okra leaves as opposed to the pods. Other than the general property of acting as a thickening agent. I think my goal will be to make a sort of sauce out of them. First chopping then fine, sautéing a bit, adding a little liquid. And after tasting, possibly pureeing in the food processor. I am not sure on the seasonings. We will have to see as we go. But I can imagine a thickened sauce with a Cajun orientation to it – Cayenne, maybe oregano, chili powder, give it some Bam! Something along those lines. But I have to see what it tastes like first. Unfortunately, because of all the Mother’s Day things we have planned, I won’t be cooking this all up until tonight – too late to post pictures of the resulting dishes for the Weekend Herb Blogging. But I will post them, probably tomorrow. anyway the way you cooked that red spinach is what we usually do too, I don't know what okra leaves though, would like to see your dishes soon. Ilva - I liked it better than 'regular' spinach. Like spinach, it's not that there was such a strong taste, but a better texture after the cooking. There are a LOT more stems involved than spinach, however, and even though they were good, some may not like that. Gattina - some people just can't relax! I will likely make the Okra Leaves tonight, so we will see! I think your farmers market sounds really wonderful. Ours is not even open yet. I like the sound of the red spinach. If you have a moment, please make a visit to my adventure holiday site. I say with some confidence that you bought neither spinach nor the leaf of the okra plant. The "red spinach" in your photograph is amaranth greens, while the "okra leaf" is the leaf of Corchorus olitorius, sometimes called "okra leaf", but more commonly and less confusingly called melokhiya or molokhiya. Since okra itself also bears edible leaves, I hope we can all work together to keep the two things more clearly separated. Eat your greens and be healthy. Striving for the sublime, occasionally transcending the ordinary ... always despite my best efforts. Tomato Mush and Radish Clippings?! ¡Viva el cinco de mayo!